Our second chick, despite our worries, hatched during the night and appears to be thriving. Little Oscar joined its elder sibling, Gale, for regular meals throughout the morning. 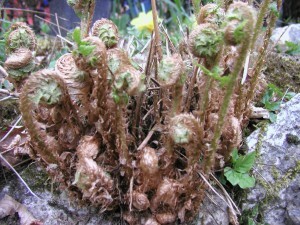 As well as being younger and thus smaller it also has darker down. 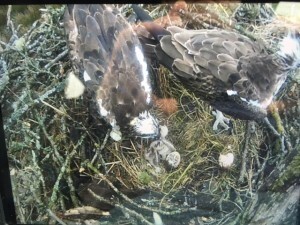 First picture of ‘Oscar’ Here KL is feeding Gale and just below is Oscar waiting his turn. The third and last egg is still to hatch. To the right is Unring with half eggshell by his feet. 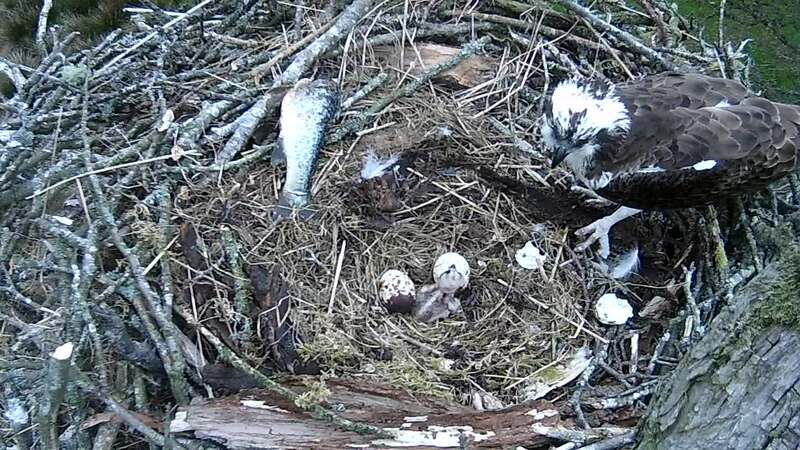 Up above the second egg seemed to be hatching today with a distinct crack appearing – but as the hours rolled on things started slowing down. As far as we can see the egg shell seems to have been chipped on one side but the membrane is still intact under it. We shall just have to wait and hope that the chick inside will have a further burst of energy in the night. OH YES! It’s a Boy – Or a Girl. Weight – about the size of a duckling (not much more than 40g.) Hatched at about 7am this morning and first seen by our early shift Protection team member. As normal for new hatched chicks it was very limp looking with a wobbly head in its first few hours – it’s a tiring business being born! But by mid morning KL had given it its first feed of trout. 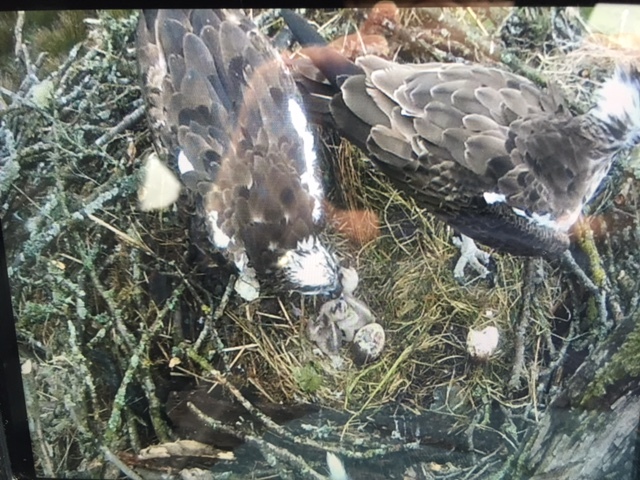 Luckily, it hatched in dry weather and we had lots of nice views on the CCTV screen at Whinlatter as KL stood up and continued to turn its shell-bound siblings around it. This afternoon though the rain lashed up the valley and KL sat firmly down on the dripping moss. The forecast indicates it will be very wet and windy until midnight, but tomorrow should be better. Photo – Covered in a Baby-gro of white down with a first meal of trout, three times its size waiting in the wings. Well done Mum and Dad! Day 37 Exercise No 3 Getting desperate – wrestle with the bedclothes. 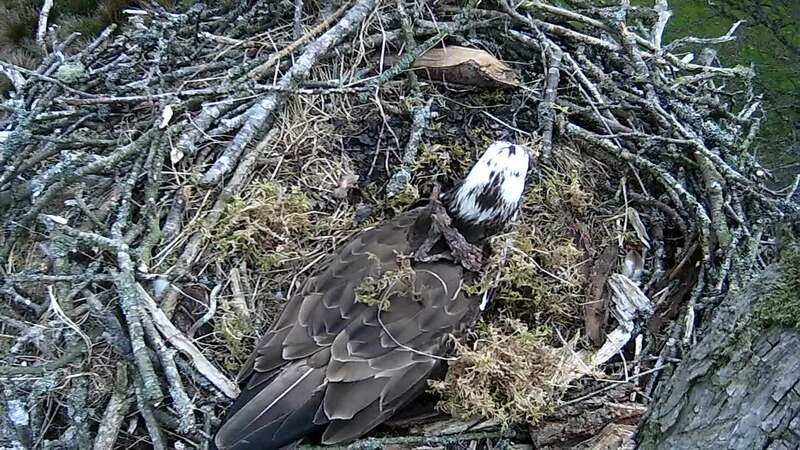 Although the material covering Unring’s back may seem to be the product of random tossing around of nest material it is, interestingly, the more extreme end of a recurring behavioral pattern. On several occasions, whilst sitting tightly on the eggs, both KL and Unring have been seen to take up wisps of nesting material and turning their heads, gently strew it over their own backs. 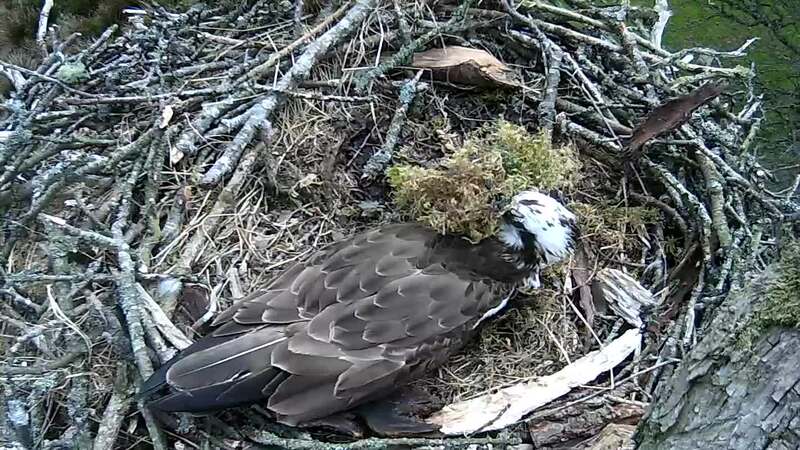 This is different to their usual regular activity of re-arranging the sticks and other nest material within reach to build up the sides and bowl of the nest and does not entail preening. It seems to have no particular plan or purpose as usually the material is too sparse for either warmth or camouflage and falls straight off. However, in this picture Unring seemed to take this gentle activity up a level and flicked these bits with vigor over his back and sides. 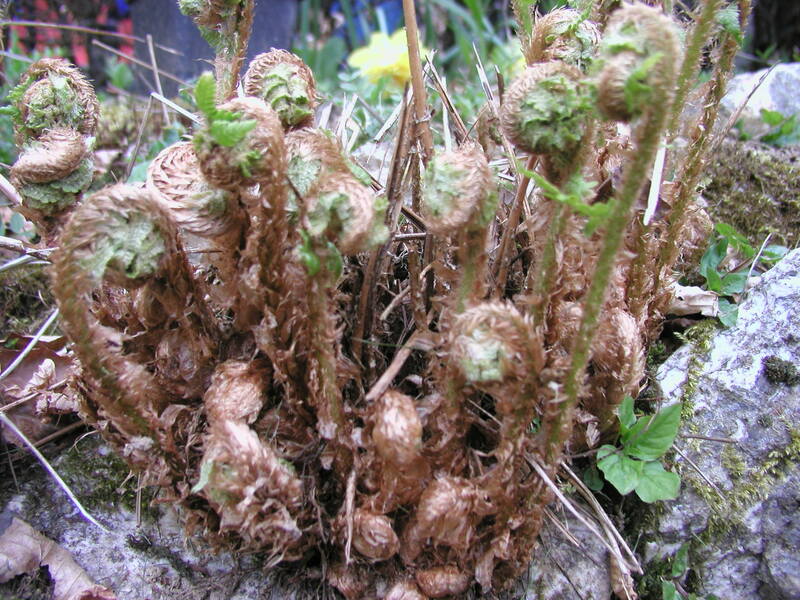 Behaviors that are out of context with the activity in hand (in this case incubation) are usually labelled ‘displacement activities’, many of which need a complex set of variables to trigger them. For Unring;s human counterparts ‘Pacing the corridor’ is perhaps comparable! The early morning of Day 35 was one of constant changeovers. 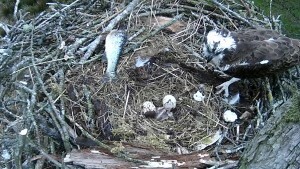 First Unring and then KL taking turns to incubate, At the CCTV screens at Whinlatter the eggs were scrutinised for cracks or chips by many eyes every time they were uncovered; both humans and ospreys acting like any imminent parents. A wash of wet weather at about 11.00 damped the excitement down and KL settled to brood. Later in the day she came down to the Lake at the lower Viewpoint and had a thorough bathe, indication that nothing was going to happen soon and by 17.30 Unring felt confident enough to leave and catch his first fish of the day. But what joys will today bring? For Day 36 – Exercise No 2. Don’t let the stress get to you. If those rushes are tickling your tush – Shred them! If you have been counting, today is the first date that the first chick might hatch. 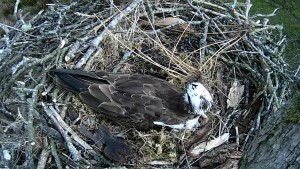 Incubation typically takes from 35 to 39 days so the egg laid on April 20th is due over the next week. 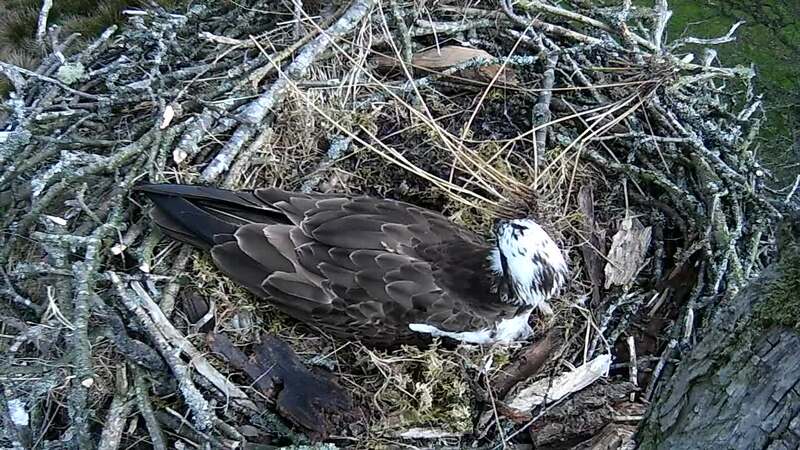 Both osprey parents have been sitting on the eggs without any interruptions so there is no reason to suppose that all of the 3 will not have an occupant ready to chip its way to freedom. However, you should never count your ospreys before they are hatched. We cannot detect whether there is life inside the shell or not but for Unring and KL the live eggs will now be periodically quivering with the movements of the chicks inside. Even so, the long wait and long hours of inactive sitting can catch up on a fellow. Here are a few of Unring’s tips to stay calm. Exercise No 1 Kill time and shake a bit of moss to death. Lake District Osprey Project; The adventures of Superbird part 2. Number 14 remains in Germany – seems to have a taste for the Reine. With their illustrious offspring, White 14,breaking records in speed, distance and time our home couple have been somewhat neglected. However, in this case no news has definitely been good news. KL and Unring have had the most peaceful and uneventful brooding period. Thank goodness! Looking at some of the other sites suffering attacks from rogue males, harbouring ambitions of founding new dynasties, broken eggs and abandoned nests a ‘boring’ incubation is just what we want. Unring has been a most attentive male, catching fish so regularly that we have not seen KL shout at him once. KL has been sitting happily, taking time out in the warmer spells for Unring to take her place for an hour or so. 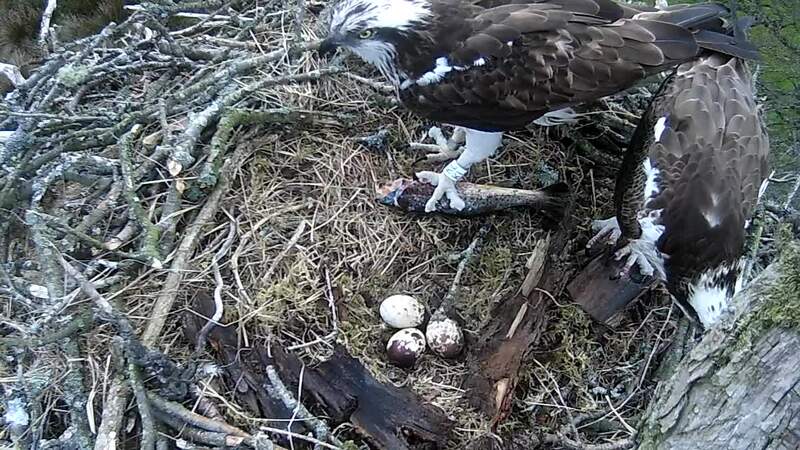 Eggs were laid on the 20th, 23rd, and 26th of April and take between 35 and 39 days to hatch – so you can work out that there is not so long to go now before we hear the click of tiny talons. 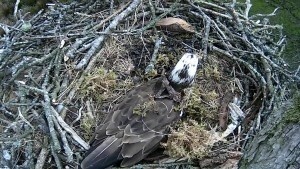 Lake District Osprey Project; The Adventures of Superbird continue. Having crossed deserts and seas Number 14 has now crossed Europe from south to north. 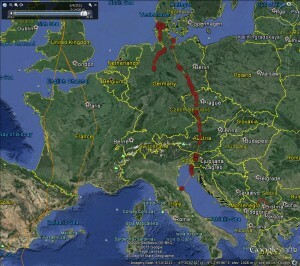 Towards the end of last week he moved up through Austria, the Czech Republic and Germany and then into Denmark. Just as we were expecting him to cross another area of water he turned south back into Germany – maybe he’s heard those stories about ‘The Bridge’ or has he heard strange pipe music coming from a town not twenty miles to the east – Hamlin! Will he stay in this area or will he maybe head for a little island to the west? 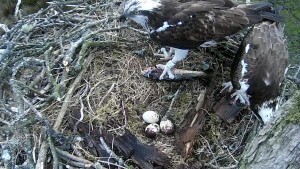 Meanwhile back at Bassenthwaite his mum and dad wait expectantly for a new arrival – one week to go before hatching day is due. Will you be at Dodd or Whinlatter on Bank Holiday Monday to possibly witness the event? Zapp! Kappow! – sorry getting carried away with the analogy. It’s a man, it’s a plane, NO it’s SUPERBIRD! Saturday 2nd May; Left roost in Tunisia 06.00 Crossed Mediterranean 0700 to 20.00. 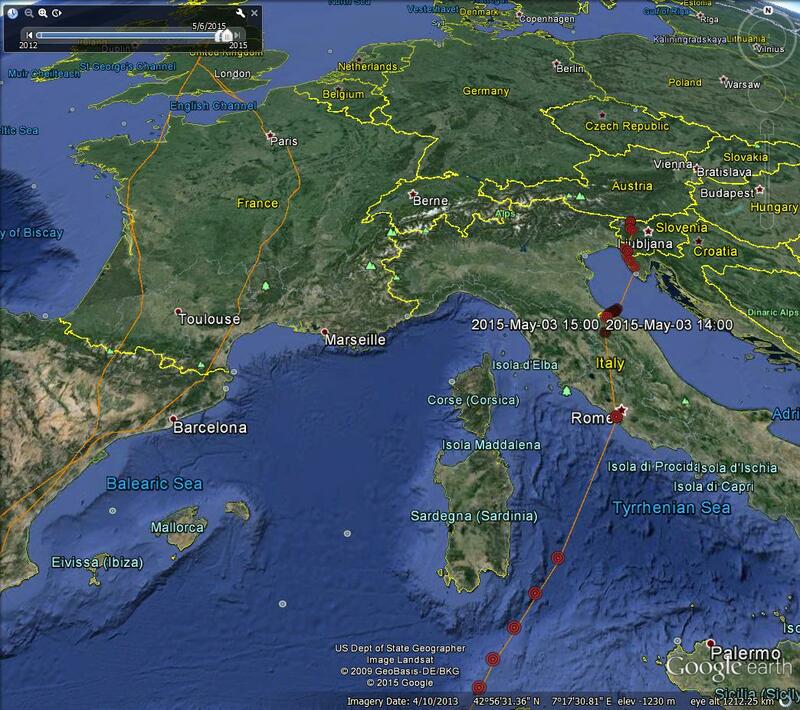 Entered Europe just north of Anzio, SW of Rome, Italy. 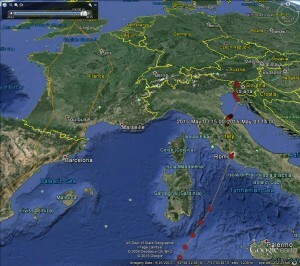 Sunday crossed Italy to the east coast near San Marino and Rimini. Monday crossed Adriatic to Croatia. Flew north into Slovenia where he spent Tuesday & Wednesday resting. Thursday just short of Austrian border heading north. Where next – Berlin – Sweden – Norway ?